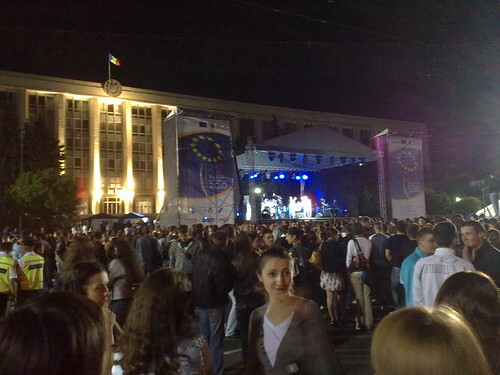 Young people often describe the change of government in 2009, which saw the AIE displace the Communists, as a turning point for Moldovan politics. It inspired them and encouraged them to believe that things would be different. Many concede that since the ‘democratic’ parties took power the situation has improved, particularly in terms of personal and media freedom and Moldova’s progress with EU integration. But this initial positivity has been often dampened. Several interviewees described how they had stopped following the political situation in the media of late because as one put it ‘the more I watched news, the sadder I got’. They often spoke of the ‘drama’ and ‘theatrics’ of Moldovan politics, the constant fighting between politicians and how lying and stealing are running rife. There was a lot of anger that politicians were just ‘hungry wolves’, acting in their personal business interests and rarely in the interests of society. One woman spoke of how Moldovan politics was just about ‘a few people […] dividing everything’; she said that ‘everyone knows’ what is going on but ‘no one speaks about it’. Another interviewee told me how politicians treat political parties as their ‘property’ using them to protect their interests and were unwilling to share power even within their own parties. The ‘democratic’ parties could not now be counted on to be better than the Communists. Politics was just a way for individuals to ‘have some kind of immunity and no one can touch you’ from their corrupt businesses and ‘dirty stuff’ that politicians were involved in. Many felt voting had no impact. One interviewee explained how he felt his vote could influence who was elected, but you could not then count on those elected to follow through on their electoral promises. Several people I encountered said that they would not be voting in future because they felt let down by the current political environment and by the failure of changes that they had hoped, and campaigned for after 2009 to materialise. A more alarming aspect of this disenchantment was that some saw a need for authoritarianism in a desperate attempt to achieve the social and economic changes necessary, for example, for EU integration. One conversation along these lines began with a man discussing how he wanted more power to lie with the president because Moldova needed ‘one good, responsible leader’. He continued by saying that a ‘dictatorial system is needed for sometime’ because Moldovans were spoilt by ‘democratic concepts’, ‘too free’ and ‘don’t respect anyone’. Four years after it was formed, for many young people, the leaders and parties of the Alliance for Integration, and now the Pro-European Coalition, have failed to show themselves to be anything other than dirty and corrupt. The coalition is now faced with the difficult task of convincing younger sections of the electorate that it is worth voting for them, and worth participating in a political process where current politicians inspire little hope. At the same time, if the Pro-European politicians are not able to do this then the Communists (PCRM) may get back into power, alone or in coalition with the Democrats (PDM). Many of those I spoke to did not think this would change the domestic situation in Moldova much. But in terms of foreign policy, the gap between the AIE parties and PCRM is huge. While the AIE is resolute in pursuing EU integration and the Communists support ties with Russia, the CIS and the project of Eurasian Integration. While the electorate overall is split in their preferences for European or Eurasian integration, Moldovan youth are stronger in their support of European integration. The future direction of Moldova may rest on how its post-Soviet generation can be inspired to participate in politics. Ellie Knott is a PhD Candidate in Political Science in the Department of Government at the London School of Economics. She interviewed young Moldovans in Chisinau in July-August 2013 as part of a wider research project. She can be followed on Twitter @ellie_knott.